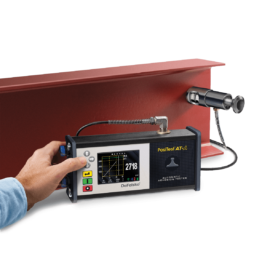 ASTM D7234 – Standard Test Method for Pull-Off Adhesion Strength of Coatings on Concrete Using Portable Pull-Off Adhesion Testers. 1.1 This test method covers procedures for evaluating the pull-off adhesion strength of a coating on concrete. The test determines the greatest perpendicular force (in tension) that a surface area can bear before a plug of material is detached. Failure will occur along the weakest plane within the system comprised of the test fixture, adhesive, coating system, and substrate, and will be exposed by the fracture surface. 1.2 This test method uses a class of apparatus known as portable pull-off adhesion testers.2 They are capable of applying a concentric load and counter load to a single surface so that coatings can be tested even though only one side is accessible. Measurements are limited by the strength of adhesion bonds between the loading fixture, coating system and the substrate or the cohesive strengths of the adhesive, coating layers, and substrate. 1.3 Pull-off adhesion strength measurements depend upon both material and instrumental parameters. There are different instruments used that comply with this test method. The specific instrument used should be identified when reporting results. This test is destructive and spot repairs may be necessary.